An account of a visit to the southern Turkish town of Suruç, where refugees from Kobanê are being put up in In Suruç's mosques, sport halls, granaries and hastily created tent camps. 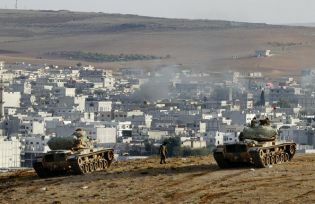 The flat, fertile region along the over 600 km long Syrian border in Turkey is an area inhabited by a mix of Arabs and Kurds. A hundred years ago still, there would have been many Armenian villages, too, as can still be found just south of the border. When the Ottoman army lashed out against the local Christian population in 1915, the Armenian inhabited area south of the modern border was probably just as affected as the area to the north. The difference is that the population to the south did not live the subsequent decades of countless legal discriminations that the Christians to the north had to endure. During a period in the 1920s or 30s Armenians were forced out of their houses in the countryside in many devious ways, for example with rules that goods on the markets had to be marked as Christian when they were sold. Piece by piece the Armenians either converted, or moved to Turkey’s cities or abroad. The same fate also met the local Yezidis. Around Suruç, the small town about which I am going to write today, the biggest local tribe, the Dinay, used to be Yezidi, so there were a lot areas sprinkled with Yezidi villages. None of them exist anymore, there are only Muslims now (although there are still some Yezidis further north-east). 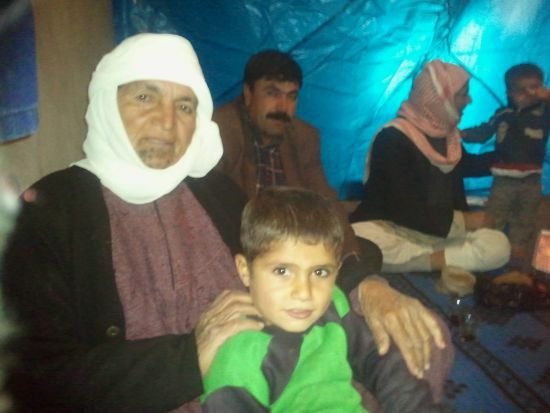 In Syria there are still dwindling Yezidi communities around Afrin and Hassaka. I have been to villages in this area of the Turkish Republic where Kurdish women wore the long flowing robes of Arabs, and Kurdish men walked around in dishdashas. In some ways the local Kurdish culture has become assimilated to the Arab one in this area. It is a very patriarchal culture. If they are rich enough to afford it, it is normal for men to have two, three or four wives and in the villages they still take the girls away from school at the age of 11 or 12. People care little about education, and more about gold and guns than anything else. The Arabs are worse with these things, but the Kurds are not far behind. It is in a context like this that Western journalists document the stories of so many Syrian child brides given to local men that are often decades older than them, so many human tragedies. Struggling refugee families feel that to survive they have no other choice than to marry their daughters in order to receive some more money to survive with the bride prize. The Syrian Kurdish city Kobanê that is right now being attacked by the Islamic State is adjacent to border, in the same cultural continuum. I was in a tent in one of the refugee camps on the Turkish side, talking to a group of men from there. My Kurdish is shaky, but I made-do, the conversation was interesting. I understand one of the men’s wives is an Arab from a small place near Damascus. Him having been a professional soldier in Assad’s army they met when he was sent there with the military. She is from the Arab Horani tribe who say of themselves that they go back to the Byzantine empire. They who sport the light skin and green eyes to prove it. Does she experience any anti-Arab racism?” I asked (although I worded it differently). In the current climate I sometimes heard people say things like that they don’t like Arabs. My first interlocutor did not say anything for a moment, and another man threw something in. It was in English, he was one of the camp’s organizers, a Kurd from Iran: “No, really not, we wouldn’t even allow such a thing”. All throughout our conversation the earth beneath us was shaken by loud bangs coming from over ten kilometers to the south. It was incredible to think that something so loud could be so far away. 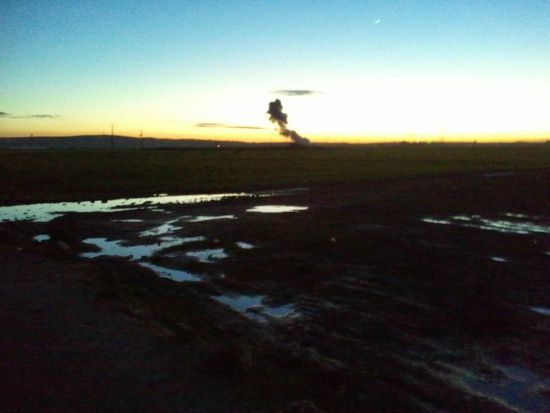 They were American bombs dropped over Kobanê. I cannot imagine how terrifyingly deafening the sound must when you actually find oneself right inside a town that is being bombarded. In the morning of that day I had joined a group of Kurdish and Turkish volunteers to help continue built a new camp. The first tents had already been put up, and the refugees that had been living in grain storehouses inside Suruç city had already moved in. I had never done any humanitarian work before, and I didn’t realize how much fun this would be. It was crazy to see all the kids starting to help us lug over the wood that was needed to make the floors. While us adults took two or three pieces per person, they could only carry one between the two of them. But because they were so many, the pile of wooden boards was decimated in no time. We worked like ants, and it was an amazing feeling to have finished. After having laid the floors of two rows of tents that were already standing, we took to putting up new tents. This was less physically taxing, but you had to be tall, so the kids could not help. Instead more of the refugee men joined us. Again, it was tremendous to work with such a big group of people and see a street of two rows of tents appear where there had been only sand. It was tough work though and in the evening I was absolutely drained of energy, and fell into bed at an indecently early hour, soon drifting off into deep sleep. I was another couple of days at the warehouse where the food is stocked and from where it is packaged to be send out to the camps. The extraordinary energy of so many people working together and the exhaustion in the evening provided quite a similar experience. It’s amazing how well things are working in little Suruç. The town in the fertile Kurdish plains counts around 50,000 inhabitants in peace time, but it is around 2.5 times that right now. Yet life is going on, the city is still functionning. The refugees have been integrated in the city of sorts, with some shops advertising in Arabic, or selling things popular on the southern side of the Syrian border like Syrian brands of cigarettes or tapes with Arabic music. And while some pay money for rent and others don’t, no one is left to sleep on the streets. People who have come from Istanbul are telling a different story, one of there being refugees all over the town centre, sleeping on the streets and begging. Although the Syrian war has been going on for three years, the number of refugees has increased manifold in Istanbul as well since the spring of 2014. Since the summer, racially-inspired murders have happened, and the houses that refugees rented were burnt down at the hands of Turkish right-wing extremists. In Suruç, people were put up in mosques, sport halls, granaries and eventually in very rapidly created tent camps. Intra-Kurdish solidarity and the efficiency of the local Kurdish BDP party organizing the refugee camps make for a much smoother situation for everyone. Another day I was with another group of refugees from Kobanê in the hangar that they occupied next to a big tent camp. They were living with 25 people in the space of about 30 square meters, which they divided into two with tarp. On one part of the tent there were three families, in the other ‘only’ two, but both with more children. They only had a small heater in each part, and a few blankets, distributed by the local helpers. They did complain of the cold at night. I thought the people living in the tents were better off (they are much better insulated) and I proposed to them to try to go to the new refugee camp being built. Again, my Kurdish is right now still pretty limited, and I could only talk about a restrained number of things. The lady next to me with the beautiful blue tattoos in her face was 70 years old and, I was told, had 25 children. Another lady, facing me, said two of her sons were fighting against the Islamic fascists in their home town. What I was not very happy about was the fact that they already knew some details about me and my private life. I had visited the same camp a few days earlier and gave away some toy cars that I had brought from Western Europe, donated by a friend. I wanted to let each child choose a car, but as soon as the kids realized what was happening a dozen of them came running toward me and literally tore the bag I had apart while each tried to grab a toy or two. After that I had been invited into the tent of one lady with her three children. I told her all sorts of things about my life, not thinking that the news of the German woman who spoke Kurdish would make the rounds quite as much. About her own plight the woman told me when she fled she had come with two other children , two three-month old babies, twins, a boy and a girl. They were ill, although I did not understand what they had. They died once she had crossed the border. In the chaos of the flight she had lost the members of her extended family who maybe could have helped her, and she was not able to go to the hospital. I did not inquire about the father of the children. Even though this incredible brave woman was smiling most of the time, the only time I pronounced the words “your husband…” I could see in her eyes something terrible had happened. Rebecca Giersiefen is a polyglot who works as a translator from Russian and French, and writes in her free time. She recently got a publishing contract for her first book which focuses on social and political topics in the extended Middle East.